Eastleigh is having its very first Pride this September 8th. We are inviting everyone to help celebrate the achievements of the LGBTQ+ community and to educate all on the struggles that have been faced in the past and those that are still faced today. We will be welcoming all communities to celebrate the LGBTQ+ community and how far the community has already come. Even though acceptance of the community has grown drastically, we would like to educate how much further we need to go to make sure that everyone is accepted and feels safe for who they are. Why do we need a Pride we hear you asking? Well Home Office figures show that recorded hate crimes based on sexual orientation and gender identity increased by 45% between 2016 and 2017. In everyday life, we all feel like we don’t belong at times. Pride encourages people from all walks of life to come out for LGBTQ+, showing their solidarity to the community. Pride reinforces a sense of belonging that is rarely replicated in everyday life. Our mission is to be fully inclusive of all sections of the LGBTQ+ community, to provide a celebration of the LGBTQ+ life and a platform to continue the fight for equality and challenge prejudice. We are aiming to establish Eastleigh Pride on a sustainable footing and grow the event over time to serve better the needs of Eastleigh’s LGBTQ+ community. Bringing you a fantastic line up of acts to entertain the crowds, a strong line up of stalls holders who will be promoting themselves and showing their support to the LGBTQ+ community – including organisations and services who support the LGBTQ+ community on a daily basis and lots more! In recent, a national survey of 108,000 LGBTQ+ people has revealed more than two-thirds avoid holding hands in public and 5% reported having been offered “gay conversion therapies”. These figures prove that society still has a long way to go to treat all walks of life equally and that we need Pride events to let the LGBTQ+ communities know that we are here for them. We stand in solidarity with them and we are here to fight alongside them. 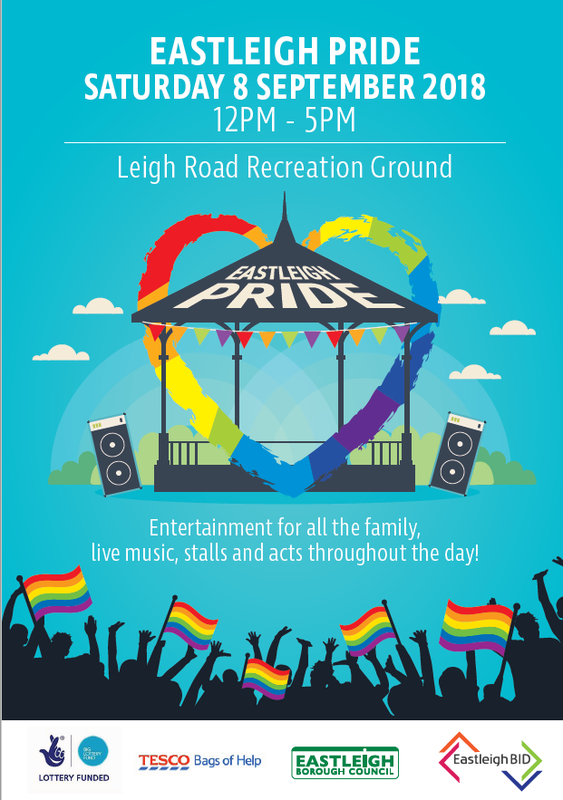 Eastleigh Pride will be on Leigh Road Recreational Ground on Saturday 8th September from 12pm until 5pm. After the main event finishes, venues throughout Eastleigh Town Centre will come alive with their own mini after parties, so the celebration doesn’t end when the main event finishes.